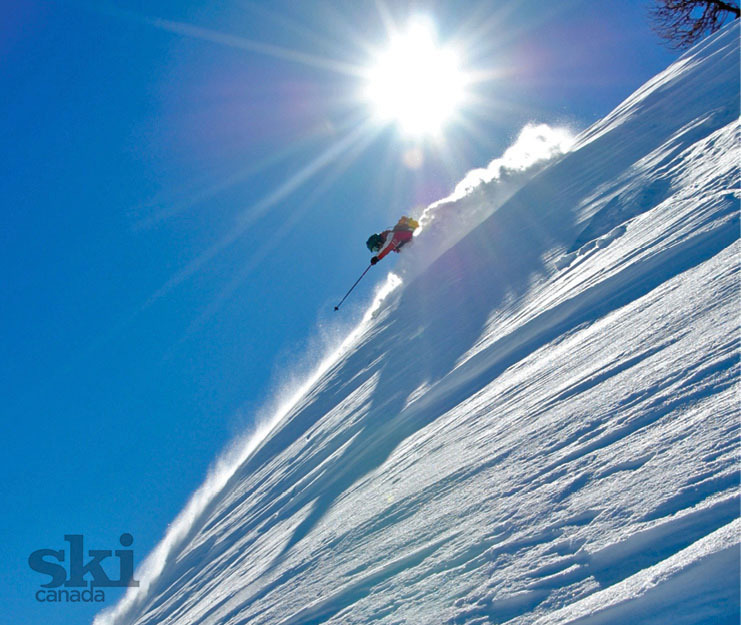 Most skiers are familiar with the damage that ultraviolet-ray exposure can do to skin, such as painful sunburn, wrinkles and cancer, but many of us are unaware of the significant risks that skiing can pose to unprotected eyes. UV radiation is not part of the visible spectrum, and for our purposes can be divided into UVA and UVB rays. UV-ray exposure increases by three per cent for every 100 metres of elevation and another 50 per cent due to snow reflection, making sun exposure in the alpine a high-stakes game for our eyes. Both UVA and UVB rays can damage the eye but in different ways, mostly because of their respective frequencies. UVB rays have a higher frequency and therefore damage the structures in the front of the eye, such as the conjunctiva, cornea and lens. A day of excessive exposure to UVB rays can cause the equivalent of a sunburn to the conjunctiva and cornea that can result in the painful condition known as snowblindness. More gradual exposure to UVB rays can lead to development of a pterygium, which is a warty-like buildup of the conjunctiva that grows over the cornea and gradually blocks vision. Pterygium (also called “surfer’s eye”) often needs removal by surgery. UVB-ray exposure also damages the proteins in the lens of the eye, turning the clear lens cloudy and resulting in premature cataract formation. UVA rays, on the other hand, are of lower frequency and penetrate to deeper structures in the eye such as the retina. Damage can include injury to the most crucial part of the retina, the macula, which is responsible for colour vision and fine visual detail. UVA exposure is increasingly thought to play a role in macular degeneration, which is the leading cause of adult blindness. How do we save our eyes? Wear goggles or glasses that have 100 per cent UVA and UVB protection—even on cloudy days! Labelled on packaging, also look for a UV 400 label (or G-15 in European brands), which means complete UVA/B protection. Since UV rays are not part of the visible spectrum, never assume that a dark pair of lenses block more UV rays. Most reputable sunglasses and goggles will have complete UV protection, but pay careful attention to children’s sunglasses, which are often lacking. Remember that UV damage to the eye, like the skin, is cumulative so it’s important for kids to wear goggles even on warm cloudy days. Somewhat counterintuitively, partially cloudy days allow 25 per cent more UV than bluebird days due to a phenomenon called the “broken cloud effect,” where the UV rays are reflected diagonally from the edges of the clouds. Fully overcast days still allow about a third of the UV rays to come through so keep wearing your goggles, although probably best to use your low-light lenses. Even non-tinted glasses with a UV-blocking coating work. Dr. John Foote is an emergency room physician at Toronto’s Mount Sinai Hospital and a Devil’s Glen skier.